One of Florida’s greatest treasures is the natural wonders of water found throughout the state, including lakes, creeks, rivers, and coastlines. These bodies of water not only provide an invaluable natural resource for agriculture, recreation, and power but also endless artistic inspiration. What began as a canoeing trip among friends evolved into the exhibition, Florida Waterworks: Friends, Teachers, Students. 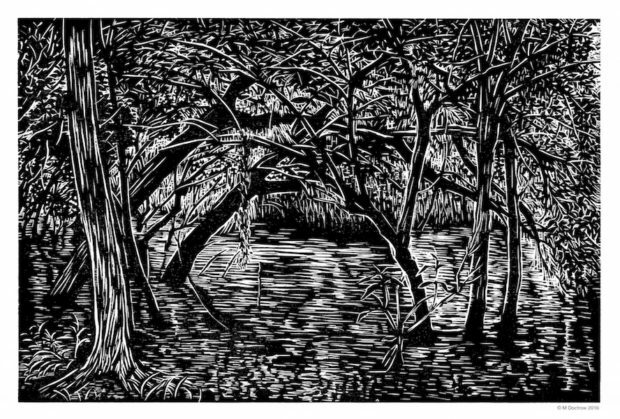 These artists came together to interpret locations such as Peace River, Lake Istopoka, Charlotte Harbor, Hancock Lake, Charlie Bowlegs Creek, and Arbuckle Creek.